The Joker Lawn Ornament | Nerd Much? With Halloween just around the corner, it’s about time that you start thinking about your Halloween decorations. 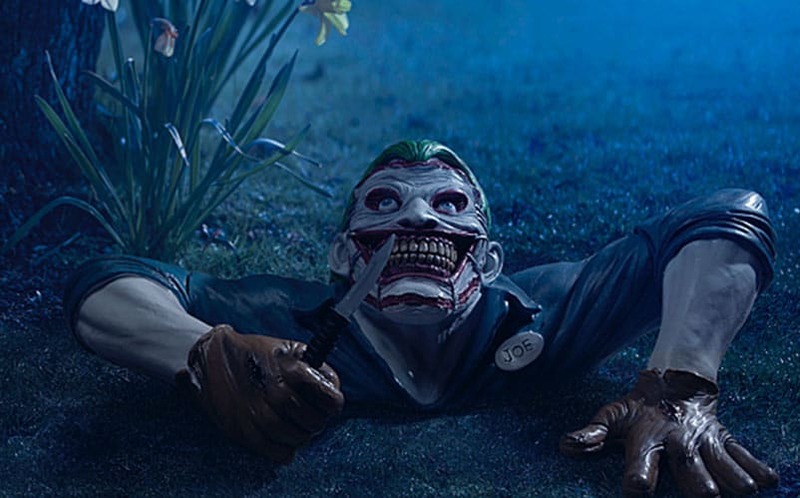 That’s exactly why ThinkGeek has released a slew of new decorations for your nerdy needs, including this Joker Lawn Ornament, The Joker Ground Breaker. This huge lawn ornament is 36″ wide by 24″ deep x 10″ tall, easily towering over your zombie lawn gnomes you likely just bought. This Joker isn’t the Joker from Batman The Animated Series, but instead takes its design from his latest appearance in DC’s Batman comic, when the A Death in the Family arc began. It’s by far the most sinister-looking and thus terrifying of the numerous Joker designs we’ve seen in the extensive Gotham universe. This statue is officially licensed by DC, and The Joker will look great clawing out of your garden, scaring trick-or-treaters this year. It’s the scarier iteration of Joker, for sure — which is why it makes the perfect addition to your Halloween decor. It’s available now at ThinkGeek for $39.99. For more cool Halloween decorations this year, stay tuned to Nerd Much — we have a lot more coming.